While doing press for Les Misérables, Lily revealed to DigitalSpy the advice Anne Hathaway, who played Fantine in the big-screen version of the musical, gave her when they ran into each other at an event. You can read all about it below! Lily Collins is tackling the challenging role of tragic Fantine in the BBC’s new version of Les Misérables – and has revealed that she received an important piece of advice from Anne Hathaway. Hathaway won the Oscar for Best Supporting Actress for her portrayal of Fantine in the big-screen version of the musical Les Mis, while Collins is appearing in a TV version based on Victor Hugo’s original novel – so no songs. Though she was instructed by series director Tom Shankland to “disregard all previous adaptations”, Collins encountered Hathaway by coincidence at “a big fashion event”, where the pair spoke about their parallel experiences. The pair were eventually introduced by a mutual friend. “I didn’t ask for any advice,” Collins said. “But she said to me, ‘Just don’t lose yourself, because it can get really tough – that’s a really overwhelming character and it goes very deep and it’s very emotional’. 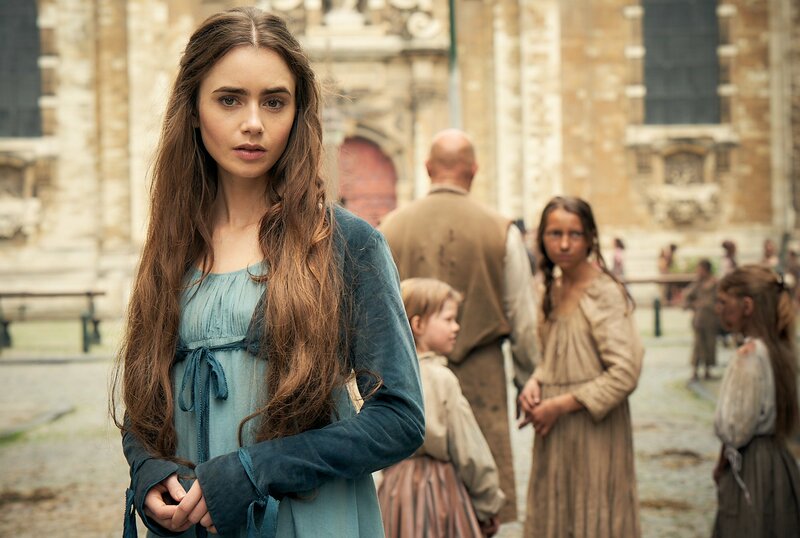 BBC has released promotional photos, including episodic stills of Les Misérables, and some just happen to feature Lily in her role as Fantine! The mini-series is set to premiere December 30 on BBC but while we wait, take a look at these photos! BBC has released the official trailer for Les Misérables, starring Dominic West, David Oyelowo and Lily Collins and we’re blown away by it and absolutely cannot wait to see Lily in such role. As of a release date, looks like that’s still a mystery – All we know is that it’s coming out in 2019. You can watch the trailer below. Hey Lilyians! 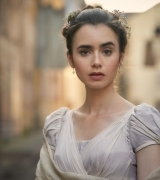 BBC has released the first look at Lily Collins, who is set to play Fantine, and her co-stars David Oyelowo and Dominic West in the upcoming mini-series Les Misérables! Along with the photos, we bring you a small video released which features a few scenes of the mini-series (yes, we get to see a little bit of Fantine)! There is still no word on when the mini-series will air, aside from that it will be in 2019. What do you think of this first look? I am excited to watch this mini-series! Fantastic news, Lilyians! Our girl is set to star in BBC’s Les Miserables Mini Series, according to The Hollywood Reporter. She’s joined by David Oyelowo and Dominic West and production is set to begin next month! BBC One and Masterpiece have set the cast for its forthcoming take on Victor Hugo’s classic novel Les Miserables. Set to star in the six-part drama from Andrew Davies are David Oyelowo (Selma), Dominic West (The Wire, The Affair) and Lily Collins (Okja, The Last Tycoon). West will take on the role of Jean Valjean, which the actor called “one of the greatest characters in world literature.” “His epic journey of redemption is one of the extraordinary roles an actor can take on and I can’t wait to get stuck in to bringing Andrew’s brilliant adaptation to the screen,” he said in a statement. Davies will go back to the original novel and delve deep into the layers of Hugo’s story, revelling in Jean Valjean and Javert’s cat-and-mouse relationship against the epic backdrop of France at a time of civil unrest. Davies, Faith Penhale for Lookout Point, Bethan Jones for BBC Studios, Mona Qureshi for BBC One, Rebecca Eaton for Masterpiece, West and Oyelowo will executive produce. Tom Shankland will direct the series, which was was commissioned by Charlotte Moore, director of BBC Content. Production is set to begin next month in Belgium and Northern France.